Our acoustics team were able to help improve reverberation problems in several meeting rooms to reduce meeting room noise. 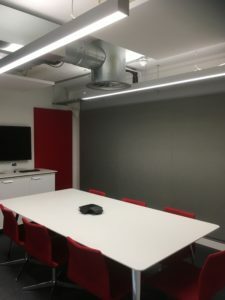 Our client had significant problems with sound reverberation in their meeting rooms. This was exacerbated by the predominance of many hard surfaces in these rooms which included window glazing, a solid structural ceiling and internal glazed and solid partitions. These construction features acted to reflect sound to cause high reverberation times that users of the rooms experienced as a noticeable “echo”. As is common, it was very noticeable when conference and video calls were taking place. 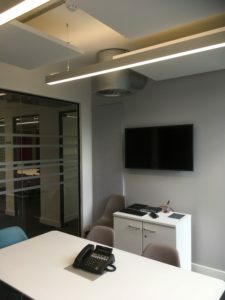 The solution was to recommend Class A absorber panels that could be suspended from the structural ceiling, interspersed between the complex network of facilities and services. The acoustic rafts hung horizontally at upper levels provide the best solution to this type of noise problem in offices, since there is a doubling of the absorptive surface area. This ensures that noise is captured from beneath and from above the acoustic raft when sound is reflected from the soffit. In the rooms the quantity and size of acoustic rafts could not adequately reach the required surface area coverage of absorption. Therefore we recommended the deployment of additional acoustic wall panels, that at 40mm thick, provide a leading Class A absorber. 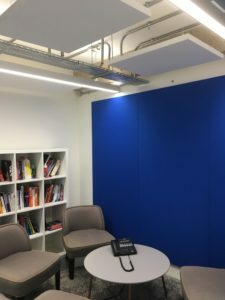 Our acoustic rafts and acoustic wall panels can be made in a huge choice of colours and have the added attribute of being very durable which makes them suitable to help improve acoustics in schools, acoustics in public areas and acoustics in offices. Following the installation, the positive feedback from the client was appreciated “Richard and his team were a pleasure to deal with from start to finish. The acoustic panels have greatly improved the sound quality in the rooms we installed them in and they look good too”.